Mapping experiences is becoming increasingly popular. We see designers and marketers, customer experience professionals and development teams relying on visualizations to help them better understand the experiences they are creating. But it’s a jungle out there when it comes to terminology. A key message of my book Mapping Experiences is to not get hung up on labels—they are less important at the end of the day. Instead, focus on how you’ll show value alignment visually to engage others in you organization in a conversation. Nonetheless, after studying and using various diagram types for a number of years, I’ve noticed some key distinctions between them. The types of diagrams most often conflated are customer journey maps, experience maps, and service blueprints. These are all chronological maps, so the mix-up is understandable: they have a similar form and use. Customer journey maps typically view the individual as a customer of the organization. And, there is often a decision involved: to purchase a product or service. Experience maps look at a broader context of human behavior. They show how the organization fits into a person’s life. Service blueprints view how a service—often a real-time encounter—is experienced by a customer. Breadth and depth vary for each as well, providing a different scope and focus. Customer journey maps tend to focus on the experiential side of the equation, with only a brief description of the service provision processes. An experience map focuses on the broader experience. Service blueprints focus on the backstage processes. 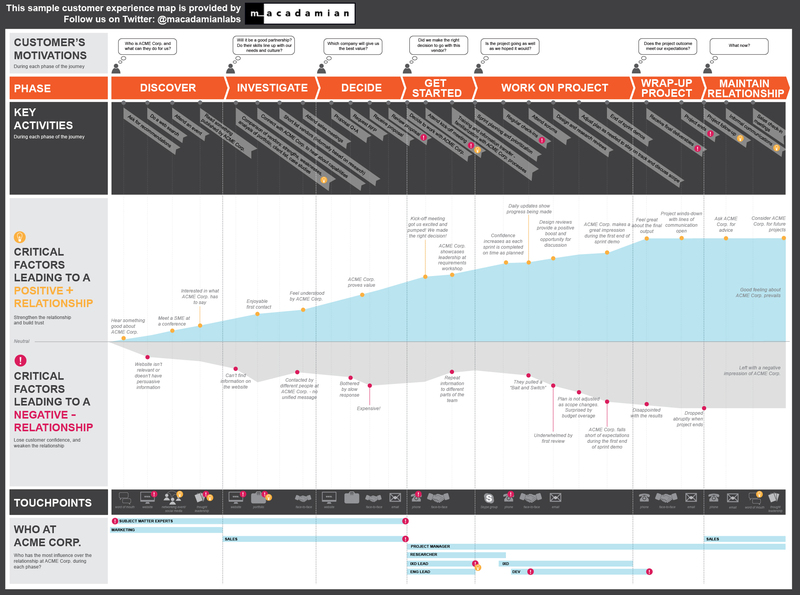 FIGURE 1 shows a customer journey map, created by Macadamian, a full-service software and design firm. The rows in the center of this map clearly focus on the positive and negative experiences of the individual as a customer of the organization. And there is a decision point in the middle. FIGURE 2 is an experience map for being pregnant. This was created by Beth Kyle, a Senior Technical Analyst at Cornerstone Information Systems, during her graduate work in Human Computer Interaction at Indiana University. The focus here is human experience, not on a particular company or business. There is no purchase decision or point of purchase. The organization is not explicitly represented, but implied. As a result, multiple organizations could benefit from this diagram. FIGURE 3 is a service blueprint. They tend to focus real-time interactions, though not necessarily so. Service blueprints typically show more detail of the backstage service provision mechanisms, as well, and they lack depth in describing the person’s experience. The above distinctions are not absolute, and the lines are blurred. Many of the distinctions are historical more than practical. What one personal calls a “customer journey map” another calls an “experience map.” There are even various combinations of terms, like a “customer experience blueprint” and others. But I’ve observed a difference in point of view, scope and focus between these three diagram types. Again, the exact label you use may not matter at all. The important thing is to understand the nature of the diagram type you’re using and that it’s appropriate for the situation. I’m the founder and the CEO of UXPressia (http://uxpressia.com), online tool for creating customer journey maps. In the beginning of our product design we looked through hundreds of maps available online: what concerns blueprints (in most of the cases) the difference in point of views is obvious. But when it comes to customer journeys and experience map it is a total mess. These 2 terms are used interchangeably. So thanks for pointing this out and explaining the difference between those two in such a comprehensive manner. BTW do you by any chance have a bigger version of Macadamian map? Hello Jim, thanks for sharing your thoughts on experience mapping. Could you please elaborate more on the concept of point of view? How does it change the point of view (the relationships of the individuals to the organizations) when you use different mapping diagrams such as customer journeys, experience mapping and blueprints? Thanks for sharing your thoughts on experience mapping. I might be confused about the concept of point of view, could you elaborate a bit more? How does the point of view might change according to the mapping diagram you use. Is it different when you use Customer Journeys, Experience Maps or blueprints?